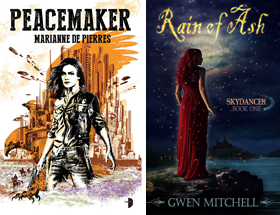 Science fiction and fantasy books received this past week included titles from H.B. Fenn, Pyr and Kids at Random House UK. Many thanks to all. Here is an overview and some random thoughts on each. Comments and questions are welcome. The Dragon Whisperer by Lucinda Hare is a gorgeously produced little hardcover full of delightful b&w illustrations by David Wyatt. Why is it that young adult books are packaged with so much more creativity than adult books? A fairly hefty read at 400 pages plus, I am sure there is a ready-made adult audience that loves dragon tales. The sequel, Dragon Isle, will be published in 2010. Quenelda has always had a magical bond with dragons, and her greatest wish is to fly one and fight alongside her father in the war against the hobgoblins. Root, on the other hand, wishes only to avoid the fearsome creatures, so the role of Quenelda’s esquire is the last thing he needs. But an unexpected friendship is forged, and when Dragons Dome is besieged by a deadly plot, this unlikely duo must find a way to defeat the dark forces. Epic battles, whispered legends and soaring magic combine in this breathtaking debut fantasy, with black and white illustrations by David Wyatt. Quenelda’s passion for dragons is based on Lucinda’s own devotion to all creatures great and small. She and her family share their Edinburgh home with an ever changing number of rescue animals, ranging from cats, dogs, rabbits and guinea pigs, to escaped battery hens on the run. She specialises in cruelty cases and animals with behavioural problems, and friends often comment that she can weave magic and talk to the animals – a real life ‘whisperer’! The Dragon Whisperer is Lucinda's debut novel. Official website. I am mostly familiar with Joel Shepherd through his Cassandra Kresnov SF series - Crossover (2001), Breakaway and Killswitch (2004) all of which I quite liked. Sasha is the first North American publication of the first book in his Blood and Steel fantasy series which first appeared in Australia with Sasha (2007), Petrodor (2008) and Tracato (2009). If the characters and action are anything like the Kresnov books, this should be good. SYNOPSIS: Spurning her royal heritage to be raised by the great warrior, Kessligh, her exquisite swordplay astonishes all who witness it. But Sasha is still young, untested in battle and often led by her rash temper. In the complex world of Lenayin loyalties, her defiant wilfulness is attracting the wrong kind of attention. The Winds of Dune is the second book in the Heroes of Dune series following Paul of Dune which I reviewed here last fall. The original Dune is one of my favourite SF books and it is good to see that these beloved characters have plenty of life left in them yet. Additional titles planned for the Heroes series include The Throne of Dune and Leto of Dune. Lots of great information on the overall series at The Official Dune Website. SYNOPSIS: With their usual skill, Brian Herbert and Kevin Anderson have taken ideas left behind by Frank Herbert and filled them with living characters and a true sense of wonder. Where Paul of Dune picked up the saga directly after the events of Dune, The Winds of Dune begins after the events of Dune Messiah. Stalking the Dragon is the third book in his John Justin Mallory Mystery series that began with Stalking the Unicorn in 1987. The character was resurrected with Stalking the Vampire (2008). Mike Resnick has written or edited in excess of 100 novels, collections and anthologies (honestly I didn't finish counting). Mike is noted for the humorous touches he brings to his writing. While I have read many Resnick novels, I have not had the opportunity to read this series which seems very urban-fantasy-like. As a side note for the urban fantasy readers of the blog, Mike Resnick is also the father of author Laura Resnick who was a guest here a few weeks back. SYNOPSIS: It’s Valentine's Day and private detective John Justin Mallory is planning on closing up the office early and taking his partner, Col. Winnifred Carruthers, out to dinner, since he's sure no one else will do so. But before he can turn off the lights and lock the door, a panic-stricken Buffalo Bill Brody visits them. It seems that the Eastminster pet show is being held the next day, and his dragon, Fluffy, the heavy favorite, has been kidnapped. Mallory's nocturnal hunt for the miniature dragon takes him to some of the stranger sections of this Manhattan—Greenwitch Village (which is right around the corner from Greenwich Village and is populated by witches and covens); a wax museum where figures of Humphrey Bogart, Sydney Greenstreet and Peter Lorre come alive; Gracie Mansion (which is haunted by the ghosts of former mayors); and the Bureau of Missing Creatures, a movie set where they're filming a PBS documentary on zombies and various other denizens of the Manhattan night. As Mallory follows the leads and hunts for clues, he comes up against one dead end after another. Along the way he meets a few old friends and enemies, and a host of strange new inhabitants of this otherworldly Manhattan. Aided by a strange goblin named Jeeves, Mallory has only one night to find a tiny dragon that's hidden somewhere in a city of seven million. The Drowning City is a debut novel and the first book in a new fantasy series to be followed by The Bone Palace (2010) and Kingdoms of Dust (2011). From her website Amanda says "I'm a fantasy writer, dark, urban and otherwise. I also write Lovecraftian romance, and occasionally very hand-wavey science fiction." I know it is shallow of me, but I quite like the cover and hope the book is reflective of that. You can visit Amanda Downum at her website here. SYNOPSIS: Symir -- the Drowning City. home to exiles and expatriates, pirates and smugglers. And violent revolutionaries who will stop at nothing to overthrow the corrupt Imperial government. Very nice stash of books. I like the synopsis on The Drowning City by Amanda Downum, and I'm with you on the cover, I like the dark look of it. The Drowning City by Amanda Downum is promising: The synopsis and the cover. As Doug mentioned, visit her website. There you can read Chapter one, Chapter two and Chapter three for free. Hey, seeing as how the original Dune is one of your favorite SF books, maybe you are the person to direct this question to: my husband also loves Dune (and numerous Dune books that came after) and he's been casting about for something new to read in the area of SF, though he'd be open to fantasy. He hasn't read much in either genre at all (he's kind of an essays & history guy) and I'm more from the UF side of the tracks and my recs haven't gone over so well. Anyway, would you have good recs for exciting, wonderful page turners for him? He's jealous of my far more exciting reading life. I mean, I know your site is full of great books to read, but would you direct such a guy to two or three specific ones? Your go-to recommendations? I'd be ever so grateful. Nice library grouping. These books all sound interesting and worth reading. Thanks for sharing! Oooh you got Winds of Dune. Can't wait to read your review on that one. Definitely looking forward to its release this week. Help! I am trying to decide which Lois McMaster Bujold series to start. Can you recommend one? Either Cordelia's Honor (Vorkosigan Series - it was recommended that I skip Falling Free), The Curse of Chalion (Chalion Series) or The Sharing Knife: Beguilement (The Wide Green World Series.) They all sound good. What have you read? Donna I hope to get to that one before the end of the month. Crossing my fingers that it is good. Thanks for the heads up ediFanoB! Hey Carolyn. Wow recommendations can be so subjective but I do have a couple of suggestions. 1. For SF action/space opera I would try John Scalzi's "Old Man's War". 2. For very readable fantasy I would try "The Name of the Wind" by Patrick Rothfuss. 3. For near future SF thriller I would recommend Weapons of Choice by Australian writer John Birmingham. Hi Bella might be awhile. I have a lot of reads queued up ahead of that one. Hi Leah you like Bujold too? She is terrific. I have read about half of the Vorkosigan books and all of her fantasy except the 4th Sharing Knife book which is waiting on my shelf. I loved the Chalion series but my favourite is The Sharing Knife series. Dag and Fawn are wonderfully rendered characters, the world-building is great and of course Bujold builds in a great romance as well. Hey, thanks so much for the recommendations! I really appreciate it. I agree with you about The Drowning City, beautiful cover. I have the book on my shelf at the moment, I can't wait to read it. Great haul on the book front Doug! I agree The Drowning City looks excellent! I also agree with your recommendation of the Sharing Knife Series, great series. Carolyn if he decides to get those I'd be curious to see what he thinks of them. A book and Its' cover PopinFresh. Lets hope there is truth in advertising.